A favourite at most family Fayre's, fetes in the UK, yet the stories are not very politically sound. 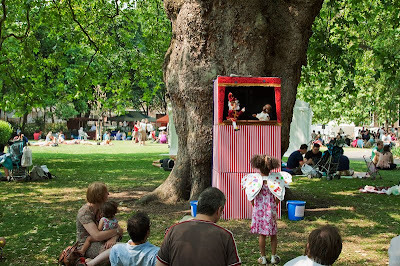 Punch & Judy shows are a rather eccentric part of a child's life here. Definitely not pc - set in a bygone age;-) I love the butterfly wings on the little girl! They have all but vanished from here. I remember making papier-maché Punch & Judy puppets at primary school and then doing a show - don't think they'd allow that these days! Great capture, that little girl looks fascinated! Mesmerizing!! Hope you are all enjoying the hot weather.